Finally we have the M version landing the automotive market. The model that we have this time is the BMW X4 2015 and the same is all set to mark its entry as 2016 production model as BMW X4 M40i 2016. Housed with utilities and comfort that will offer you a sporty driving experience the BMW model is speculated to be a new trend in the company’s manufacturing. 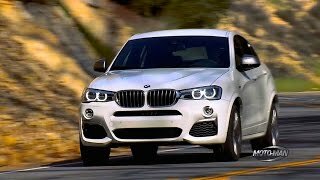 Let us have a closer look at the review of BMW X4 M40i 2016 to know more about it. The interior of BMW X4 M40i 2016 is more of tech and features based rather than simply comfort. The sportive, emotional and elegant vehicle has been adorned with an interior, especially the M leather steering wheel with shift paddles that narrates that this isn’t a normal BMW. The door sills come with ‘X4 M40i’ lettering, which also marks its ‘lightened’ entry over the instrument cluster. Talking about the infotainment and entertainment the model is equipped with BMW ConnectedDrive which avails professional navigation system with iDrive Touch Controller and a full color head-up display. Apart from these the interior of BMW X4 M40i 2016 is well equipped with safety features like City Brake Activation, Active Cruise Control, Real Time Traffic Information and much more. The exterior of BMW X4 M40i 2016 is designed to portray its value that mean sportive, luxurious and elegant. Starting with the front fascia you have the traditional kidney grille sitting amidst the LED headlights. Right beneath them are the tiny fog lamps while the bumper is total captivated by the air vents. In all there are four; two of them takes a massive wide look and sit at both the corners while the center one gets a company with a lip shaped vent beneath the grille. Moving towards the rear end Changes are subtle. It has a new trunk lid with taillights integrated at both the corners while the rightmost corner of the bumper is housed with a circular exhaust outlet. 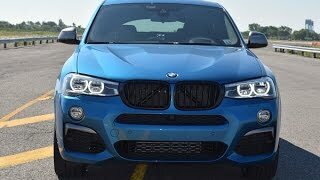 In all rounding up the exterior details of BMW X4 M40i 2016 I would say company could have added more in terms of sportiness and aggression apart from the massive air vents. Beneath the hood of BMW X4 M40i 2016 is a 3.0 liter six- cylinder engine generating total output of 355 hp and peak torque of 465 nm paired to eight-speed Steptronic automatic transmission. 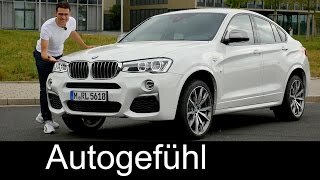 The model with this power can sprint from 0-62 mph in 4.9 seconds while the top speed of BMW X4 M40i 2016 touches the mark of 155 mph (electronically limited).